A pack of six wild dogs with their two puppies was located near to John’s Pan where they had a big confrontation with some honey badgers. 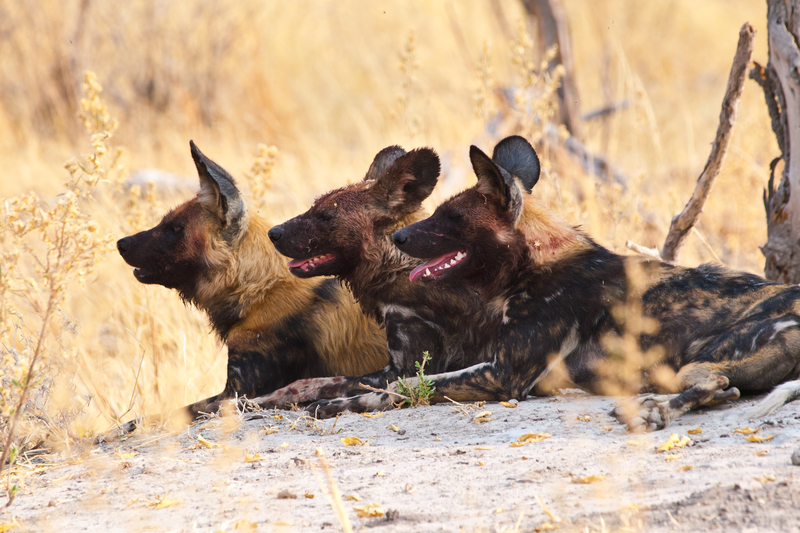 A smaller pack of two wild dogs was in the area throughout the month. One day they came right into camp as we were having morning breakfast. We followed them hunting a couple of times and once they led us to the remains of an impala which had been previously killed by the resident tom leopard. The same leopard was seen hunting red lechwe in the marshes (he is known by the guides as ‘Fisherman’ due to his preference for this habitat). A different male was located at John’s Pan where he was feeding on a red lechwe, surrounded by vultures. One day we found a leopard cub sitting in a branch near to Motswiri Pan. We went back in the afternoon and found her mother lying nearby. The female is known as ‘Jane‘ and has been resident in the area for many years. A few days later we saw Jane and her cubs sharing a red lechwe kill with her adult son from a previous litter. It was unusual, but very heartwarming, to see the different generations together in this way. The Bonga Pride of nine were seen hunting right in front of camp where they brought down and killed a blue wildebeest. The hot dry weather meant that buffalo were starting to come back towards the riverine areas, so they were also targeted. We watched the lions ambush a herd at Tsessebe Island, but they didn’t manage to make a kill before the buffaloes crossed the channel. Later in the month they had better luck and we came across them feasting on a buffalo carcass that they had just killed. In the same area we saw two lionesses with six cubs take down two warthogs right in front of the vehicle. We watched them for about an hour enjoying their first meal in days. The pride tried warthogs many times during the month. One time the prey dashed into a burrow and the pride of 10 lions determinedly dug it out, but it was a lot of effort for relatively small reward. Another time, elephants came to the rescue of the warthogs and succeeded in chasing the lions away. At the moment both the Bonga and Wapoka prides’ territories are overlapping, right over Lebala camp itself. One day the Bonga Pride stretched out and rested all day at the camp. Two days later three lionesses from the Wapoka Pride were spotted walking right in front of the main area in the early morning. We quickly jumped into vehicles to follow them as they stalked a large warthog. That afternoon we found two spotted hyenas finishing up the carcass. We were lucky enough to find two of the Wapoka lionesses with three tiny cubs. This was the first time that we had seen the new litter. A big male lion, Sebastian, has was seen mating one of the females from the Wapoka Pride. Large herds of elephant started to move into the marsh area. They were seen mudbathing and crossing the channel along with their very young calves. Hippos and elephants were heard munching vegetation around the rooms at night. A herd of roan antelope and calves was a special sighting, with sable antelope and eland also being seen during the month. Big herds of red lechwe splashing as they ran through the water always makes for a beautiful photo opportunity. Other general game included giraffe, kudu, tsessebe, impala, zebra, wildebeest, warthog and baboon. There was plenty of water in the pans and channels, attracting wetland birds such as spoonbills, whistling ducks, black-winged stilts, and openbilled storks. We saw a huge flock of pink-backed pelicans flying. Carmine bee-eaters have arrived for breeding at John’s Pan and it was amazing to watch them as they were busy excavating their nests.